It's what computers have become! (Press release it). The innovative 2-way slide concept makes it easy to switch between different modes, going from reading maps to watching a video with a simple slide. A numeric keypad slides out from one end of the device while dedicated media keys slide out from the opposite direction, converting the display into full screen landscape mode. 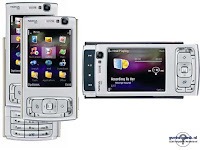 With powerful 3D graphics, the Nokia N95 has a stunning user interface that makes it intuitive to find the features and services you want.